During the pregnancy journey there isn’t a lot of certainty about how you will feel – so we were more than a little surprised to discover what you, our readers, had to say about aquamamma. After all, getting 38 pregnant or breastfeeding women to agree on something is pretty much impossible! But Australian-made aquamamma nearly achieved it. We asked you to give us some honest feedback on hydration beverage aquamamma – here’s what our reviewers had to say. While pregnant and breastfeeding, your beverage choices can be limited. Alcohol, coffee, juices, even milkshakes made with soft serve ice cream, may be off the table (or in large quantities at least!) but you don’t have to stick to water. Sydney obstetrician Dr Rob Buist has designed aquamamma especially for pregnant and breastfeeding women. 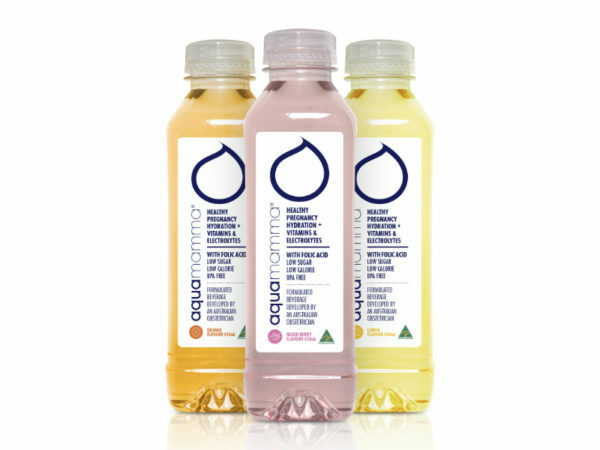 Low in sugar and sodium and with added folic acid to help boost your daily intake, aquamamma comes in three flavours (mixed berry, lemon and orange) and may help to keep you hydrated even when you’re feeling nauseated. As we all know, staying hydrated while pregnant and breastfeeding is so critical (especially when fatigue, headaches and vomiting hit). With 89 per cent of pregnant mums-to-be that we surveyed agreeing that aquamamma helped keep them feeling hydrated and 92 per cent recommending the beverage to a pregnant or breastfeeding friend, this Aussie-made product is certainly worth a second look. The mixed berry flavour was the definite favourite from our mums, but there was certainly something that appealed to everyone. “The flavours were lovely and not too sweet or heavy,” Kristy raved. After spending all day on her feet, Renae gave aquamamma a go and felt “… refreshed and energised,” she explained. “… aquamamma is delicious! It tastes so clean and crisp and instantly makes you feel hydrated,” April added. Of course, aquamamma isn’t just for pregnant women. Like many mums, Kristy found herself thirsty during her lengthy breastfeeding sessions. “I kept a bottle next to my feeding chair and it was perfect to sip on while feeding my son,” Kristy told us. The tribe has spoken! Regardless of where you are in your pregnancy and breastfeeding journey, aquamamma makes for a refreshing drink to keep you going and ensure you are hydrated. You can buy it directly from the aquamamma® website and in leading pharmacies. ® AQUAMAMMA is a registered trade mark.